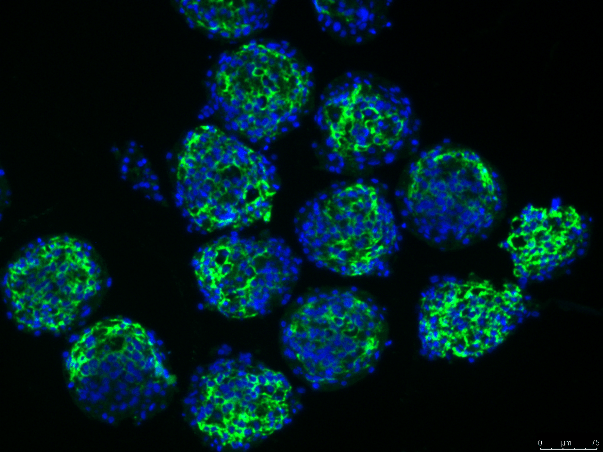 The InSphero 3D InSight™ Human Liver Fibrosis Model consists of an advanced microtissue co-culture of healthy primary human liver cells combined with specially formulated media and a TGF-β1 solution that induces the formation of fibrotic scarring. This model is designed for in vitro screening of anti-fibrotic drug efficacy and for studying mechanisms of fibrosis induction. It is engineered to incorporate all relevant human liver cells needed to recapitulate the fibrotic disease state, including hepatocytes, Kupffer cells, hepatic stellate cells, and liver endothelial cells. This powerful liver disease model has been rigorously characterized under basal and induced fibrotic conditions using histological techniques (IHC and IF), gene-expression analysis (qPCR) and secreted biomarker (ELISA) analysis. 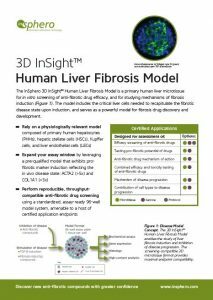 The 3D InSight™ Human Liver Fibrosis Model enables the study of liver fibrosis induction and inhibition of disease progression. The screening-compatible 3D microtissue format provides maximal endpoint compatibility. *3D InSight™ Liver Disease Discovery Platform Bundles are customized based on specific partner requirements. Not available separately. with an advanced 3D liver disease model.